Deputies had to clear out a crowd of at least 250 partiers from a vacant house owned by Bank of America early Sunday. The loudness of the party, which caused a neighbor to call the Manatee County Sheriff’s Office, was held in the 4400 block of Sanibel Way in Bradenton, according to a sheriff’s office report. The people who lived in the house just before it became vacant moved out a few days ago, but told friends they were going to throw one last party, the report stated. We need to have a law and registry that provides the home addresses, home and cell phone numbers of ALL affiants and robo-signers so we can locate and depose them!? WEST PALM BEACH, Fla. – A growing list of foreclosure filings and not enough to staff to handle the problem in Palm Beach County. The bursting housing market bubble created that double whammy in Palm Beach County. Now, county leaders have approved a new registry to smooth things out. In hopes foreclosed homes won’t be abandoned, the new registry banks would inspect foreclosed properties and give property manager names to county code enforcement. If New Jersey has no clue to what a third world country looks like… it better brace itself because neighborhoods are going to be eyesores. Just imagine who’s taking care of the nearly 20% of Florida homes that are vacant? This country is being run down the ground. Then again all they have to do is bulldoze! A New Jersey judge has ruled that four major banks can resume uncontested foreclosure actions in the state under court monitoring. Bank of America, Citibank, JP Morgan and Wells Fargo were among six large lenders targeted by New Jersey’s Supreme Court last December. NEW YORK (CNNMoney) — It’s not always easy to feel sorry for sunny Florida. But they just got hit with another blow. On Thursday, the Census Bureau revealed that 18% — or 1.6 million — of the Sunshine State’s homes are sitting vacant. That’s a rise of more than 63% over the past 10 years. Having this amount of oversupply on the market will keep home prices depressed and slow any recovery. I have the perfect solution…Why not give the current homeowner a “short sale” price modification and call it a happy ending to all? Buyers are too wise nowadays. Besides most future homeowners will have a defective title or will have an F in the past! LPS using their MN address purchased my home at auction for 75% discount put it on the market for about 80% and made a few grand from the highest contract that was accepted. It benefited no one! Now if they use my solution not only will the investors save on the fees they payout to the foreclosure mills but also on the late fees the homeowner accrues…see isn’t this economic sense for everyone? The slide in U.S. home prices may have another three years to go as sellers add as many as 12 million more properties to the market. Shadow inventory — the supply of homes in default or foreclosure that may be offered for sale — is preventing prices from bottoming after a 28 percent plunge from 2006, according to analysts from Moody’s Analytics Inc., Fannie Mae, Morgan Stanley and Barclays Plc. Those properties are in addition to houses that are vacant or that may soon be put on the market by owners. Rising supply threatens to undermine government efforts to boost the housing market as homebuyers wait for better deals. Further price declines are necessary for a sustainable rebound as a stimulus-driven recovery falters, said Joshua Shapiro, chief U.S. economist of Maria Fiorini Ramirez Inc., a New York economic forecasting firm. Sales of new and existing homes fell to the lowest levels on record in July as a federal tax credit for buyers expired and U.S. unemployment remained near a 26-year high. The median price of a previously owned home in the month was $182,600, about the level it was in 2003, the National Association of Realtors said. Fannie Mae, the largest U.S. mortgage finance company, today lowered its forecast for home sales this year, projecting a 7 percent decline from 2009. A drop in demand after the April 30 tax credit expiration “suggests weakening home prices” in the third quarter, according to the report. There were 4 million homes listed with brokers for sale as of July. It would take a record 12.5 months for those properties to be sold at that month’s sales pace, according to the Chicago- based Realtors group. About 2 million houses will be seized by lenders by the end of next year, according to Mark Zandi, chief economist of Moody’s Analytics in West Chester, Pennsylvania. He estimates prices will drop 5 percent by 2013. After reaching bottom, prices will gain at the historic annual pace of 3 percent, requiring more than 10 years to return to their peak, he said. “A long if not lost decade,” Zandi said. You mean to tell me you cannot place homeless families in these?? Lets get Habitat for Humanity in here…this doesn’t smell right! DETROIT, MI (MICHIGAN RADIO) – Wayne County and some of Detroit’s biggest religious institutions are partnering in a push to demolish vacant homes. The plan is to use more than $4 million in Federal money to knock down 450 blighted properties in 45 days. 12 clergy members worked with the County to identify “target areas” for demolition near their churches. A number of the leaders plan to use that land to develop housing projects. Bishop Edgar Vann of Second Ebenezer Church says that’s appropriate because churches are rooted in the community. 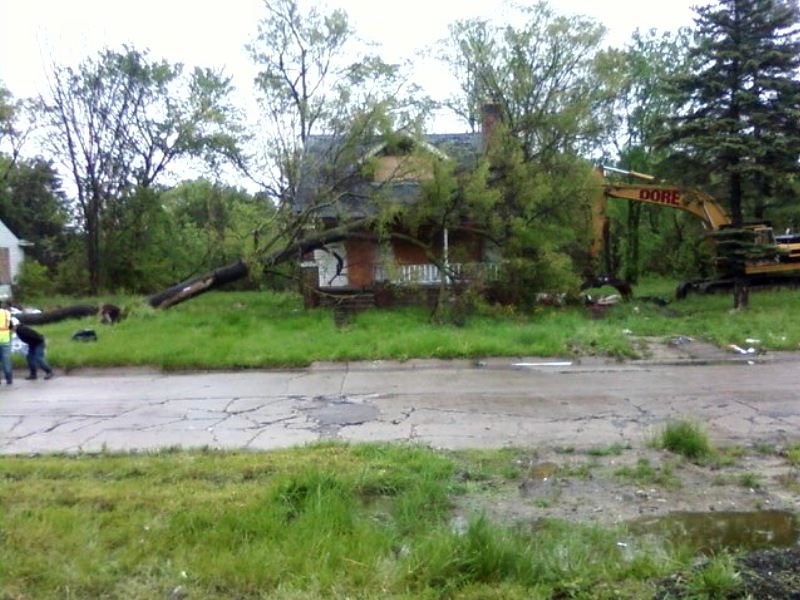 There are an estimated 33,000 vacant homes within the city of Detroit. The city demolished 860 last year.